The proprietors were C.A. Stoner and J.E. Stoner. The business offered "healthy and hardy fruits and ornamental trees, shrubs, vines, roses, etc." Special attention would be given to orchard planters and those designing lawns and parks. 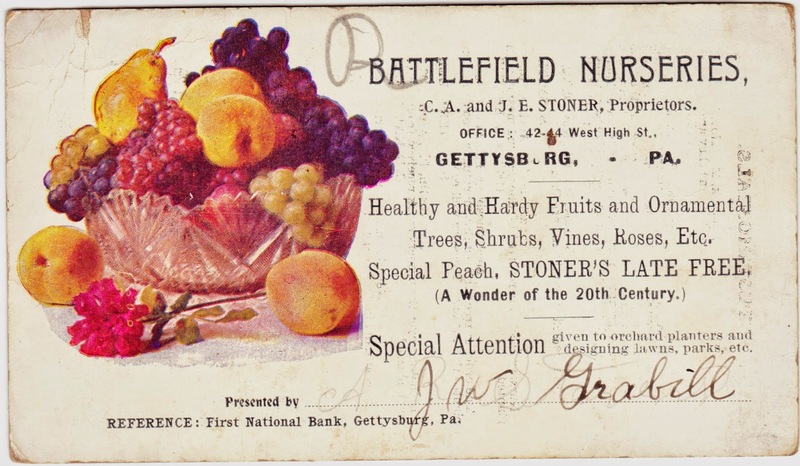 Battlefield Nurseries had 6½ acres in Gettysburg, according to the eighth annual report of the Pennsylvania Department of Agriculture for 1902. That made it the fifth-largest nursery in Adams County, behind only C.L. Longsdorf in Floradale, W.E. Grove in York Springs, O.P. House in Bendersville, and A.S. Wright in Bendersville. "Frederick, Md., Nov. 17, 1902. We received the pear trees O.K. and they are fine. C.E. KLEIN." "Franklintown, Pa., April 13, 1903. It is with pleasure that I wish to inform yon [sic] about the trees that I bought of you this spring. I am very well pleased with them and I find that every person in the whole neighborhood that secured trees are pleased. I have been talking with a great many about buying trees for fall planting and they all intend to plant Battlefield Nurseries trees. MILTON HOFFMAN." "East Berlin, Pa., April 4, 1903. In looking over the nursery stock received from you I am much pleased. C.B. KAUFFMAN." "New Germantown, Pa., April 11, 1903. Trees at hand in good shape and well pleased. S.A. GEETSHALL"
"Barnitz Sta., Pa., March 30, 1903. Trees received O.K. J. WARREN PEFFER." "Monaghan, Pa., April 11, 1903. Would you please send me one more shade tree — Carolina Poplar! They are fine and I am well pleased with them. JOHN BURGARD." 1. In Gettysburg, 42-44 West High Street is now the site of a multi-family home, according to Trulia.